If you already know about Social Bookmarking And Thing That Social Bookmarking is Easy Task Then You are wrong Because If you are Doing Spamming On Social Bookmarking Sites Then your website link will Be blocked From Their And if you are Bookmark Your website Link on Social Bookmarking sites with Wrong Methods Then Penguin Hit your website Very Fast. So Always try To Bookmark you Link with Right Techniques And methods. This Post is All About How to Do Social Bookmarking With Proper Way and best Social Bookmarking Sites List. Here Are Following Benefits of using Social Bookmarking sites. Why use Social Bookmarking Sites. Social Bookmarking is an Off-page Seo Link Building Technique. 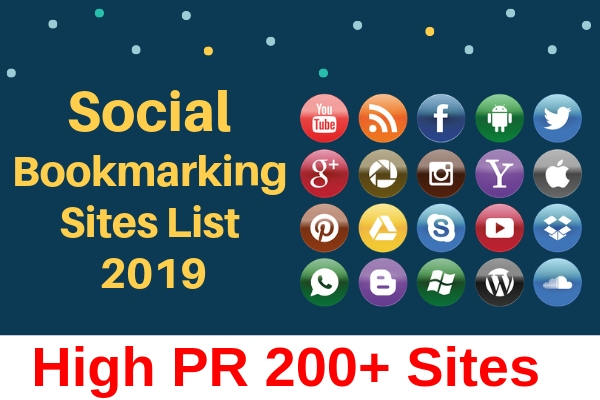 Social Bookmarking is An easy Linkbuilding Technique But Always Doing social Bookmarking in Right way I also Covered in Detail in This post. With Social Bookmarking You can Share your website link, Video, images, Articles On That’s Sites And Build Very Good Backlinks From them. If you are Doing Social Bookmarking then You Get Backlinks From Those Bookmarking Sites. Instead Of You are Get Good Amount Of Referral Traffic to Your Website and Also Help To Promote Your Website. Many Newbies asked this Question much Time Why We use Social Bookmarking Sites. If you learned All about Seo Mean To Say On-page SEO And Off-page SEO. Then you know very Well That in Off-page SEO We Do all the work Related to Outside of Our website to promote it. If you Are New Blog Or website then Social Bookmarking Site helps to get backlinks, Traffic And Promotion. Social Bookmarking Sites Helps To Get Referral Traffic to your website. Social Bookmarking Sites helps To Promote And brand awareness. It will Help to Reduce Bounce Rate of your website. Helps To Get Viral Your Post Or Website On Social Media. So All the Above Are Most Valuable Reasons to Use Social Bookmarking. So Now You have better Understanding Of Social Bookmarking and why use Social Bookmarking and Benefits of Bookmarking. Now you are Going To Learn How to Do Social Bookmarking with Right Ways or Techniques. Before Staring that how to Do social Bookmarking keep In mind All the social Bookmarking Sites Are Not same. Some websites are Block you immediate If you are Doing Spamming them because They are Strict rules or Term And Conditions Of using them. So Always Try To Read all The Term and Conditions About Bookmarking site before submitting Your Links To Them. First Step Is Make Account On all Social Bookmarking sites its very simple just need to click Signup and Fill your information Like Name, Email address and Password etc. let’s Start And So You Some Simple steps before Going To Know How to do social Bookmarking. And You Have Ready All the Following Things In Your Note File Or Wordpad. because you Need When you are Doing Social Bookmarking. Always Try to Change Your description When submitting links It’s very Important. and Try to Write 400 phrases. In Tags Filled Most Important you primary Keywords. Reddit: How to Submit Link To Reddit. if you are Submit your Link To Reddit Then Its Really Valuable for you but Reddit has very strick Rool to Always Post Links with right Technique. 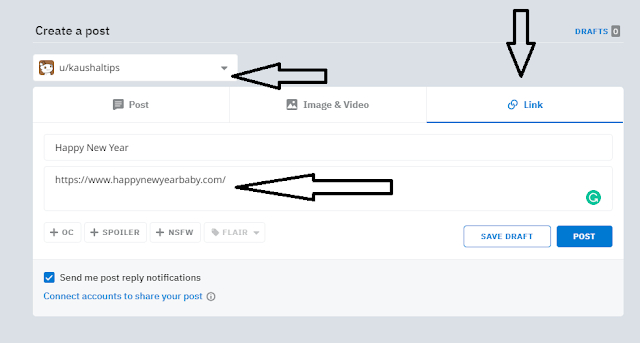 Here is Just simple Step to Do Social Bookmarking on Reddit. The first Step is made Your Account on Reddit its very Easy enter your Name, email Adress and Password etc. The second Step is Click On Submit a New Link Button. Look At Bottom Image. 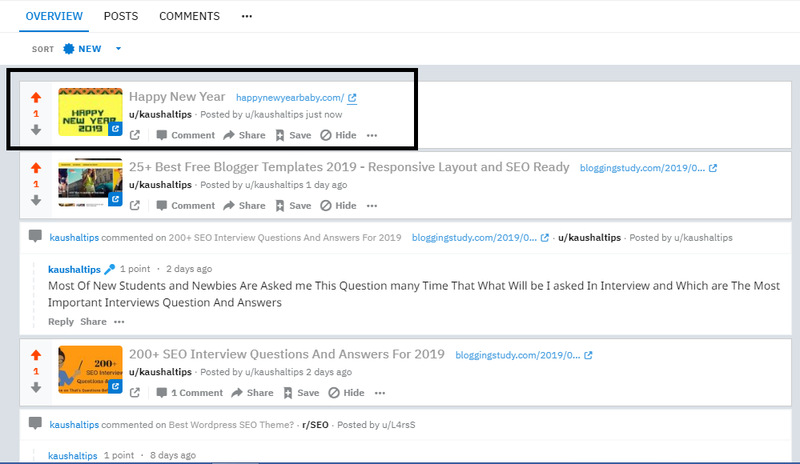 After clicking on Create post or Submit new Link then 3rd Step is To fill Link of your website homepage or any Blog Post. Same Like As bottom Image. For Submitting Link Click on Link Button then Fill your website Address Or Blog Post Link. then Always keep In Mind if you are New To Reddit Then Click On Your Profile as A Community Because it You are Select any other your post will be Approved. So Just Click Your Profile as Same Like Upper Image. After Filling All The Information click On Post Botton. Now You Are submit link To Reddit And You also Check you’re all Reddit Link submissions. So Now You are Create Backlink With Reddit. Tumblr: It is Also A Great Social Bookmarking Site. Tumblr Is microblogging Website Founded by David Karp and owned by yahoo inc. Follow These all the Following Step to Create backlinks with Tumblr. The first step is Go To Tumblr and Make Your account On It. Second is Click On on link Button You can Find in Your Account dashborad Same like as bottom Image. 3rd Step is Filling All the Information related to your website or blog post like Title, description, Tags etc. After Filling All the Information Then Click On Post button. 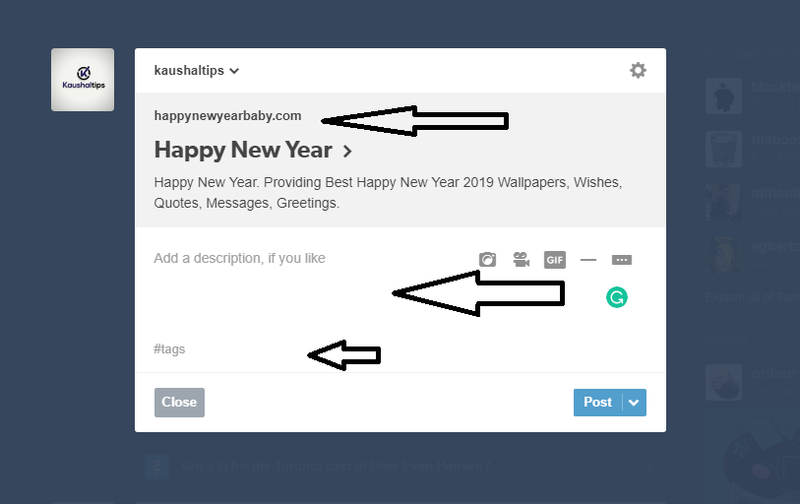 So Now you are Create backlink with Tumblr And You can See it On your Dashboard. So, Guys, I hope you Understand That How to Submit Link To Social Bookmarking Sites. You Only Just need to Your Website Or Any Post or Post Title, Description and Tags. and If you are Still Confused That then Don’t Worry In Future I will Also Show you How To Submit Link To other Social Bookmarking sites. So now I Am Share With you Top Best Social Bookmarking Sites list with high Domain Authority, Page Authority Etc. Dear Seo Beginners or Expert I am Sharing Only Most valuable Social Bookmarking sites list. And Not Hundreds Or Thousands of Site. Make Few backlinks But with Right techniques and Right ways, This will help to improve your Off-page Seo. So at The End Of This Post, I hope You Know All about social Bookmarking For Example: What is Social Bookmarking, Why use social Bookmarking, Benefits of Using Social Bookmarking, How to Do Social Bookmarking, Top High pr Social Bookmarking Sites List. If you Use any other website for Bookmarking then Let me Know in Comment Box So I will Add-In This List. That’s where I constantly struggle and also I just wind up looking empty display for lengthy time.